Projection, is the throwing of a ferment or tincture onto a substance in order to effect a transformation of the substance. A good time to: relinquish the flow; feelings project, thoughts swirl, and lessons are suspended for observation, no need to interfere, just learn. Challenges: unnaturally relaxed; despite a feeling that duty calls and you should try to get moving – push me pull you. Balance: use your gut to move your hands; a little unattached impulsiveness may be helpful. Astro bits 14-15 July, 2017! July 14, 2017 at 10:26 pm | Posted in Astrology | Comments Off on Astro bits 14-15 July, 2017! Mercury in Leo sextile Jupiter in Libra, Jupiter quincunx Neptune, Moon is in Pisces. What the? You may have thought, idea, word or conversation, and you think it or say it with sass, you feel bold. Neptune is the slippery part, it may not find its mark at this point, is it a hit or a miss, who knows? It can feel like something just out of reach, you keep missing it. Trick is to keep believing, keep having the thought, pray, at some point if it’s yours it will stick, you find it. The words, thoughts, idea, conversation will happen. In the meantime, use the Pisces moon to relax, chill, mediate and pray. 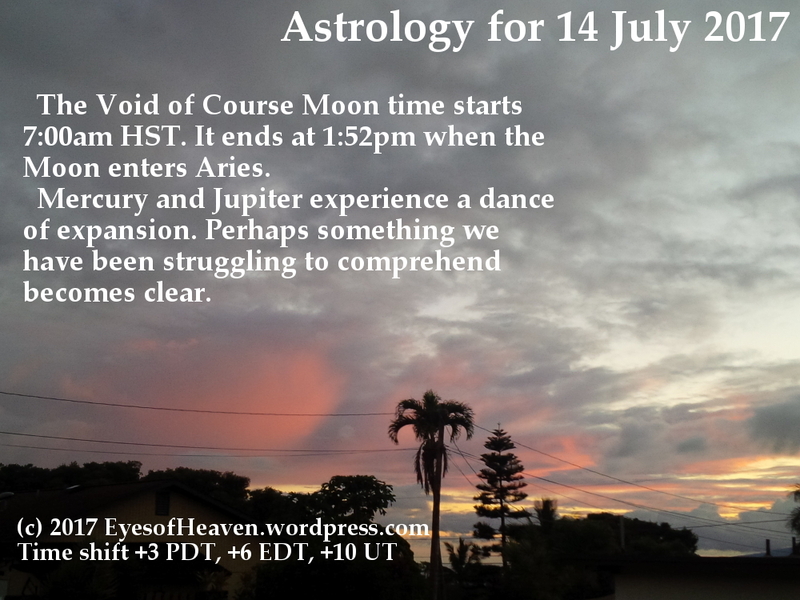 July 14 The MOON is VOID OF COURSE, which means that it is moving from its last major aspect between the classical planets before it moves into the next sign, from 10 am PDT/1:00 pm EDT to4:52 pm PDT/7:52 pm EDT. All V-o-C time periods are not good for making important decisions. Tradition states that “under a V-o-C Moon, if you start something, nothing good will come of this.” V-o-C Moon times are good for doing mundane things that simply have to be taken care of, and an excellent time for meditation. Moon is still in watery emotional PISCES until 4:52 pm PDT. Moon makes a nice watery trine to the CANCER SUN and Mars later today. If you are feeling water-logged, overly emotional, compassionate, needing to fantasize a lot, feeling sentimental, just wanting to protect your home turf and your stomach is acting up, you can chalk it up to that. Snapshot: Saturday brings a bit of irritation between motivations and desires. But by afternoon there is magic that carries us into early Sunday. Sunday offers adjusted expressions, Soulful clarity and unexpected desires. At 1:49pm (EST) on Saturday Venus at 11:55 Gemini Semi-Squares Mars at 26:55 Cancer. This is our own male/female energies in irritation mode or an irritation between the sexes and our passions and desires. Mars wants to initiate nurturing while Venus is rather fickle and changeable. Not a big deal, just be aware. At 3:23pm Venus at 11:59 Gemini Biquintiles Pluto Rx at 17:59 Capricorn. Snapshot: On Thursday night (EST) we have to adjustment our ‘crisis of faith’ to our sense of fun and romance. Friday is busy with Higher-Minded expressions, magical healing and Karmic clarity. At 10:13pm on Thursday Mercury at 13:47 Leo Ses-Squares Chiron Rx at 28:47 Pisces.